My name is Mitz from http://tips4pc.com/ and I have been a Windows computer geek for over 25 years. I have seen software come and go over the years, succeed and fail, but Windows Live Photo Gallery is definitely a keeper. I know this software is not new, however I feel that people are not seeing its full potential. Some of the features included with Windows live Gallery are so new to all of us, that we do not even know we have these amazing abilities on our computers. Without further ado, I will mention some of my favorite features in Windows live photo Gallery. 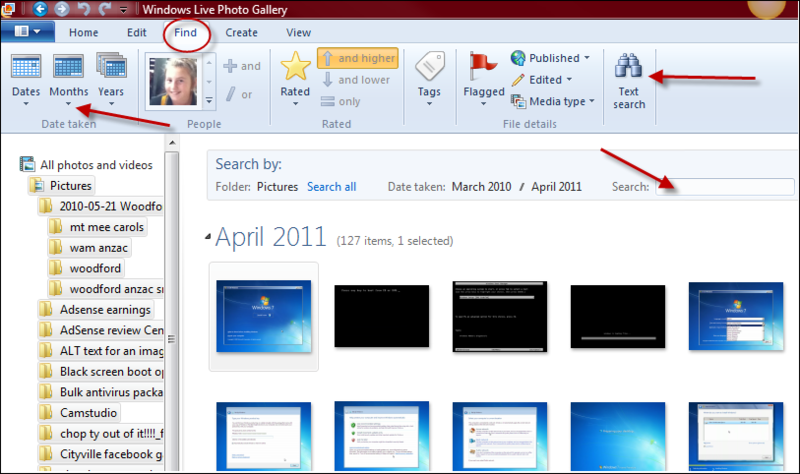 Windows live photo Gallery has its own Find tab entirely dedicated to finding the photo or video you want on your computer. This makes it so much easier to find a lost photo or picture on your computer. Simply go to the find tab at the top of the program. Choose a folder from the left navigation pane. If you do not know what folder to choose, I usually click on my pictures folder. You can search by dates, tagged faces, star rated, or even simple text search. In the screenshot below, I first pressed on the Months icon and narrowed my search down to April 2011. After doing this I pressed on the text search icon on the right. Now I can type in what I am looking for and the search has already been narrowed down for me. This is by far my favorite feature in Windows live photo Gallery! 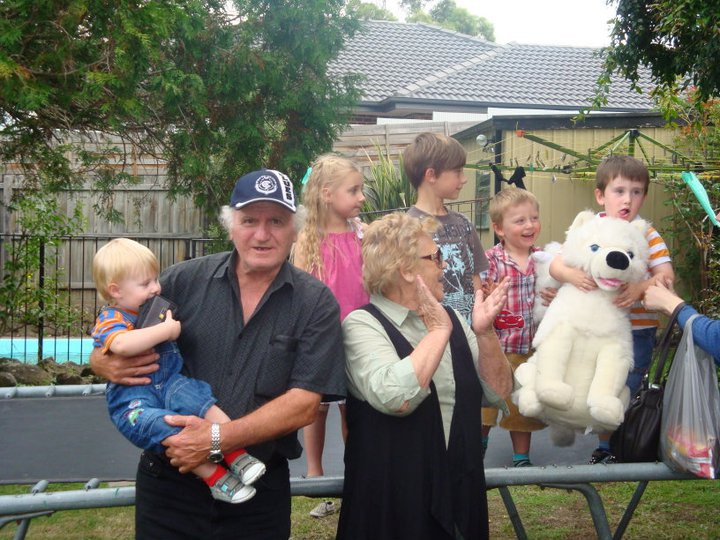 You can get three or four pictures and turn them into one really great photo. Look at my examples below. Initially I started with two photos, took the best from them both, and then ended up with a photo where everyone is facing the front. How to fuse photos together? Select two or more similar photos in the Windows live photo Gallery by putting a tick in the left corner of the photo. This means it is selected. Go to the create tab at the top and click on the photo fuse icon. Select the area of the photo that you want to replace. When you have done this you will see some choices appear. Pick the best part of the photo by clicking on it. Your photo will now be changed instantly. Go through and change all the parts of the photo that do not look right. When you are happy with your picture you can click on the close file icon at the top. Your picture will be automatically saved. You will see that you now have a new version of the picture in the folder where the original pictures were saved. If you are an expert at retouching photos using Photoshop then you will probably cringe at the thought of using anything else to do the job. Let me tell you that this retouch tool is just a quick fix and will not do the same job as a professional photo editing program. Here is an example below. 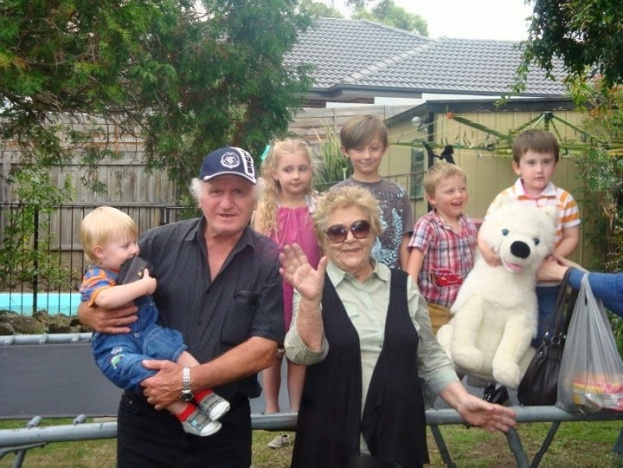 Look very closely at the clothes line in the background. In one photo it has a cloth on the line and in the other it does not. I removed the cloth in literally one second. All I did was select the area and it was taken away. Now with this kind of photo the Windows Live Gallery retouch tool worked well for me. Double-click on the photo that you want to retouch. Click on the retouch icon at the top of the screen. Select the area on the photo that you want to read touch. For example, I selected the cloth hanging from the clothesline. You may not be able to select the entire section, therefore just choose a small area. As soon as you choose the area it will change. When you have finished retouching the photo simply press close file. As I said, this photo retouching tool is really just for the simple jobs but it is very handy to have around because it is so quick to do. I definitely will be using for jobs likes this.. It is fantastic that Windows live photo Gallery is able to import photos and videos from your digital camera. Back in the days when Windows XP was king, we had the Microsoft scan and camera wizard to import photos to our computers. Unfortunately when Windows Vista came along, the scan and camera wizard disappeared from existence. This is why it is great that Microsoft has bought out Windows live photo Gallery as I see this program as more than an equivalent to the Microsoft scan at and camera wizard. On the home tab in Windows live photo Gallery, simply press on the import icon. Make sure your camera or device is connected to the computer and on so Windows live Gallery can find it. Choose your camera from the list and click import. Now you get many choices when import in your photos to your computer. You can review organize or group photos so you will have no trouble finding them in a year or two. When you are done choosing, categorizing, and so on, choose import. I strongly suggest that you check out Windows live photo Gallery for yourself! It is seriously an all in one program that is absolutely amazing because it is free. There are so many more features included with this software that it would probably take an entire day to go through. What is your favourite feature in Windows live photo Gallery? Comment below and let me know. Great tips for a great application. Microsoft did a great job with their Live apps and Live Photo Gallery has recently added support for raw format in most cameras. I use this for 90% of my photo work, and I rarely need to use anything more powerful. RAW support definitely bumps this app into a higher class – that was a good move. Given the positive comments, I’m going to take this one for a spin. Nice column, Bill! I use several photo editing and management products, but I really like WLPG. It’s a winner. I haven’t used this app – but, after this article I might just give it a shot. Looks very interesting but I haven’t used it as I have all my personal family photos stored on Drive H: and it seems that WLPG will only access the User section of the C: drive. Is there a way to change to a different drive ? I’ll leave this one for Mitz. Just to let you know I’m still very happily using Cyberlink PhotoDirector 2011 for which, through the good auspices of your blog, I received a free licence a few months ago. I’m sure Windows Live Photo Gallery is fine for those wanting a quick fix, and it’s free. For my purposes, though, PhotoDirector definitely fits the bill. Cyberlink made us do a little work for that free license but, like you, I found it was very worthwhile.